Blog entry from last year November. We had a few birthdays in a row in November. Birthdays stories are told at the end of the day replacing the regular story. The wooden rainbow flower shaped pieces are laid over a rainbow silkie. The story usually includes four-legged furry animals, feathered birds, ocean animals, insects, plant kingdom, and a guide or an angel. Small wooden figures representing each group are placed on wooden flowers as I tell the story. The story begins with all the creatures anticipating the arrival of the baby. The guide leads the way for the baby to come to the loving hands of the parents. Time of the day, weather, the phase of the moon, who were present at birth give the picture of the baby's arrival. The story talks about the seasons as the earth goes around the sun. One year passes and the child turns one. One like one earth, one sun. I light one candle. We talk about the child's activities then. Then we recognize the following year, the child turns two. Two like two eyes, two hands, two legs. I light the second candle. The story keeps going until we come to the age that the child is turning. Usually, the child's parent that joined us will tell remarks and significant events of the past year and/or the birth. We wonder what wonderful things the new year will bring to the child. We sing happy birthday to the child and the child happily blows out the candles. No presents, but sometimes small treats are shared by the child's family. Since there were so many November birthdays, I told the story of Father Birthday from a book Gateways by Wynstones Press. This story is about an old man who lived alone who remembered that tomorrow on his birthday, he has no one to celebrate it with. It sounds like a sad story, but the ending shows the same old man with a contented warm heart. When he wakes up in the morning, he finds an egg and a candle on his bedside table. He starts the woodfire to preheat the oven to bake his birthday cake. "It must have been Father Birthday who came to me this morning", he says and he breaks a piece of cake to place it on the heath. This is another post I was not able to publish last year. Our Lantern Walk and Martinmas was held right in the preschool neighborhood. Carrie and Matthew hosted it as this being the last year for their daughter to attend the Children's Garden. We enjoy visiting their garden every Friday for a walk, but to be there in the evening was very special. Once again, we had a wonderful story of St. Martin by Sherry Lovett. Children listened very carefully about the caring and compassionate act of a person whose faith carried him for the rest of his life. Then we sang "Down With Darkness Up With Light", "Glimmer Lantern, Glimmer" and "Red and Yellow, Green and Blue". We were ready to light our handmade lanterns. Each one had a beautiful soft glow. We went to a few houses in the neighborhood to sing songs. They were all very happy that we stopped by. We sang songs along the way up the hill and down again. Everyone managed to keep the lantern safe. The fresh bread was pulled out of the oven and warm soup and other items of food were shared after the Lantern Walk. They provided good nourishment. Outside in the garden, the lanterns made beautiful luminaries and Matthew played a hand drum that played mystical music into the dark evening. The campfire kept folks warm and families visited with each other under the starry sky until it was time to say good night. One of the unique features of the Children's Garden is in the mixed aged program. We have one-year-old through 5 years old children in one group. The most preschool program divides up groups by age. One year old will be in the classroom with children up to two years old or maybe three. Three to five maybe together if lucky. Lucy Lodge who birthed the Children's Garden decided the age limit and it has always stayed the same. We try not to have too many one-year-old at the same time. One year old turns the classroom to a family room. When we have one year old, the two years old children suddenly become capable of helping themselves. Most children try hard to take care of the little one who is not talking or sometimes not walking yet. The older children use their senses to work around the little one. The caring and thoughtfulness naturally come out of the child. We have had R join us for visits in November and December. Children brought cup and napkin at snack time for R and even set up the chair so that R can sit in front of the teacher and be helped by the teacher during the snack time. During the walk, other children made sure that R's hat was not covering his eyes. I am thankful for the mixed age program because it gives real needs and reasons. When I gave R early snack and explained to other children his stomach is smaller and he needs to eat more often, no one said, "I want to eat too". When children understand what we do make sense, they are willing to cooperate. I admire this kind of maturity for even two years old children. I often talk to one year old and send messages to the children who are watching and listening to me. It helps with the transition time and also when there is conflict. It is a little sneaky way, but sometimes things are better not said directly to a child with eye contact that diminishes their confidence while building guilt and shame. Softened messages are received with much appreciation by tender souls. The mixed aged program naturally encourages both older and younger children to offer their best. It makes everyone to be aware of how we continue to grow our body and understanding, and it helps everyone to strive for the higher self. What a wonderful gathering of neighbors and family we had for the Harvest Festival! We were blessed with pleasant autumnal weather. All morning, children and teachers cut the vegetables and stirred the steaming pot. There was onion, garlic, swiss chard, kale, rainbow corn, beets, tiny eggplant, pepper, red cabbage, purple green beans, butternut squash, and carrot. We added the beans that we shelled as well as mushrooms that we harvested carefully the day before. Thyme and basil added aroma and the homemade miso was stirred in at the end for taste. While the soup was cooling, we had a lovely circle to sing an autumn song as well as play the children's favorite game of Duck Duck Goose. We introduced our names, and neighbors were given special thanks for sharing their garden that children can explore throughout the seasons. It is so wonderful to see the faces of families and the neighbors who were connected with the children. I imagine the children often talk about the neighbors who they met on our walk to the family members. Harvest Festival gives a chance for us to be acquainted with each other in the beginning of the school year. Speaking of the new school year, so much has happened in the preschool community already. One whole human being was born to one of the families. We admired the two weeks old baby that joined us on a special day. We enjoyed the Harvest Soup and wonderful dishes that families brought. One young adult guest that joined us was from Florida who after Hurricane Irma was able to purchase enough gasoline to drive to North Carolina. We send our thoughts to those affected by the hurricane. I felt humble just to be able to enjoy the ordinary day. It has been delightful to have the all outdoor June program. Lead teachers have planned the rhythms of the day beautifully. Activities such as painting, clay modeling, river rock collecting for the rock garden are among few of the activities that children enjoyed. Snack time out in a child-sized picnic table with a cheerful tablecloth while listening to the bird songs fill our heart with joy (and fill our lungs with fresh air!). Cups and napkins are washed and dried in the sun for the next day. The simplicity and community living go hand in hand. There are usually eager volunteers to help push the cart to the building to get the water tank filled daily. We often have the opportunity to meet creatures close-up in June. Red efts and garter snakes, caterpillars and fire ants. Children buried a dead mole and dug it up again. We are taking care of three ducklings. Children are very curious to how the ducklings behave to a stimulus. We have found out: Ducklings do not play with a ball or leaf boat. They do eat a dead spider. Children had a chance to make new friends and meet new assistants that came during June program. We look forward to celebrating the summer with Summer Pixie Party on Friday, June 23. The year is quickly passing by. Lady Slippers are quietly blooming to let us know that it is May, the Mother's Day month, and it is nearly the end of the preschool year. We had 10 happy children ready to go on the Lady Slipper Walk and some of their parents, grandparents, and friends were able to join us. We took our time stopping for everyone to catch up and pointing at flame azaleas and giant ferns growing. We stopped to have our snack of sandwiches and fruits and a drink of water. We remembered to sing the blessing before the snack was over. Everyone went on "nature potty" and the nappies were tended for the younger ones. We had one last stop before viewing the flowers. I told a story of the magical slippers that helped a young child to find her way home. This child was a kind-hearted child that earlier had given up her own slippers to the forest friend, rabbit, who had hurt feet. The message of the story also included that we must not pick the "slippers" so that in case some fairies got lost, they can wear the magic slippers to find their way home just like the little girl in the story. We finally got to view the beautiful lady slippers. Pink ones were many in number while yellow ones were scarce. Children recognized the unique flowers and excited to show the teachers and friends. The mid-morning sun was filtering through the trees reaching all the way to shine on the flowers. We managed to not pick any or step on them by accident. Thank you children. It was all downhill on the way back. Most children ran along the trails through the woods happy and satisfied. We even got to the soccer field where we were supposed to meet the parents an hour earlier than the pickup time. We decided to change the plan to meet the parents back at the preschool. Children walked tirelessly, that is all except for the two 2 year olds. They needed a little break here and there to be carried by the teachers. 1-year old E was mostly carried as we went a little faster than his pace. Safely back in the playground, everyone whose legs were exposed got a thorough wash with tecnu, soap and water to prevent them from getting poison ivy. We checked children for ticks. Another day to celebrate. Thank you to everyone for the lovely day. We were given a beautiful morning to work on the playground. We were productive with spreading the mulch around the playground. We put a fresh coat of paint on the tower structure. We worked on the fence and tightened up some areas that were damaged by a fallen tree. We tried to rabbit proof the fence so we can have our bunnies visit the playground. We even mulched the path to the playground. We took down the old picnic table and brought in wooden crates that can be used as playing structure. Parents and children worked together. We are so grateful for your participation! We gathered around for the family orientation afterwards with some healthy snacks to munch on. Some parents expressed their excitement in starting back the school year while new parents expressed a bit of anxiety with transitioning into the new routine. We went over some "Policy and Procedure" and yearly calendar events. We have 10 families and 6 staff members this year. Looking forward to spending quality time with all the children. Thank you so much for your participation. We are off to the great start! Special thanks to Isak Pertee for a huge load of woodchips! Winter Celebration took place at Celo Community Center on December 18, 2015. Families gathered to celebrate the winter. Our potluck was delicious and eating together really made us feel like a big family. We had a lovely shadow puppet of "Bird Tree" read by O.T. 's grandmother, Nancy. It was so perfect because the story was about a boy visiting a grandmother in the countryside. We love the way the grandmother explained about how wild animals have families just like people. The older siblings of preschoolers presented a wonderful puppeteering. They came out to bow at the end. We moved upstairs to have our evergreen spiral ceremony. Starting from older children, each one was called to walk on a golden star path holding an unlit candle. The meaning is to find the inner light, our own gift that we share with the world. The path is windy towards the center where the light is lit. Then a child will find a star to lay the candle light on and walk out the second half of the path, the journey. After all the children finished walking, the room was filled with light. It gave a picture of how much light they bring to the world. On the golden star path walking little children travel far. Bring to us the light of heaven brighter than brightest star. We are so thankful for our children, parents that are raising the children, and all the loving hands that surround them all. Happy Winter! 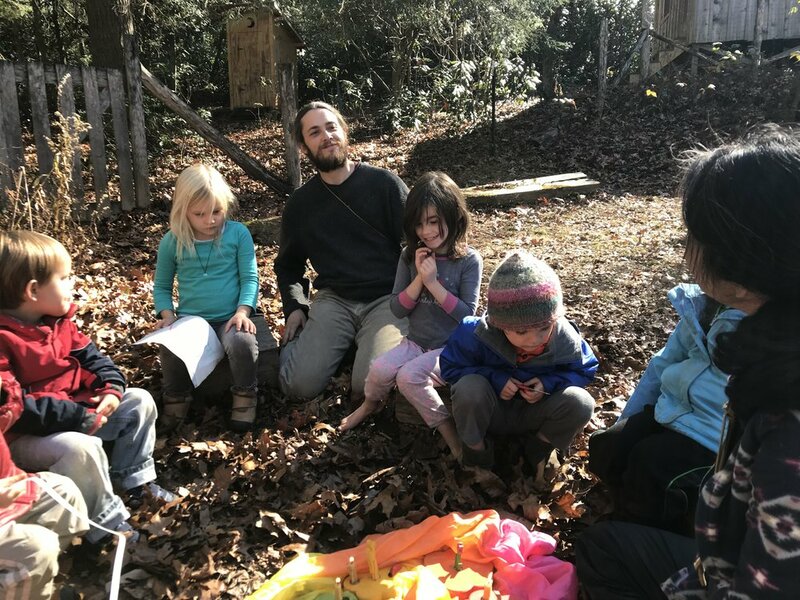 About 4 years ago, preschool enjoyed visiting a beaver working site. The beavers had built a dam across a creek about 10 feet long. We were not sure about their lodge, but it was so fun to visit and see the shavings around stumps where they had gnawed. C.E's parent informed me that there is a new beaver site by a nearby creek. Where the creek meets South Toe River you could see the trees marked by the work of beavers. How long did it take to cut down the trees? Where did they take the trees? There were many questions to answer. We also wonder if beavers would sharpen our coloring pencils. Beavers are supposed to be active building dams in fall so that they can store their food under the lodge for the winter. Beavers eat the leaves, inner bark, and twigs of aspen (a favorite food), alder, birch, cottonwood, willow, and other deciduous trees. Beavers also eat shrubs, ferns, aquatic plants, grasses, and crops, including corn and beans. On the same day C.E. brought the woodchips gnawed by beavers for Show and Tell, A. brought her tooth that she accidentally broke when she fell off a step stool. We passed around woodchips with beaver's toothmark and a human tooth that was white and had a long root. Bob Johnson in Celo said once he found a beaver tooth. I had to ask him if it were orange because C.E. and O.F. who have been studying about beavers informed me that a beaver tooth is orange due to high iron content. Bob said it was indeed orange, and it curved like a hook because beavers keep growing their teeth as it gets worn from using. How convenient if our teeth can keep growing as needed! Very unfortunately, about three weeks ago, one of preschool assistant teachers, Peg fell and broke her wrist. Peg showed children her big cast that went all the way to her forearm to stabilize her wrist movement. We had to learn to hold Peg's hand very gently at circle time. As it is introduced by Waldorf education during the first week of December I have been thinking about tooth and bones which are both minerals. For some reason, children started to play with shells at preschool too. When we do our footbath after a cold walk, we have a salt block (which is another familiar mineral) that Amanda gave us to rub back of our feet. How interesting that without any effort, the presence of minerals seem to surround the children already. We are thankful for the minerals on our planet which support and give us structures. Hopefully no more broken bones and teeth for a long time. 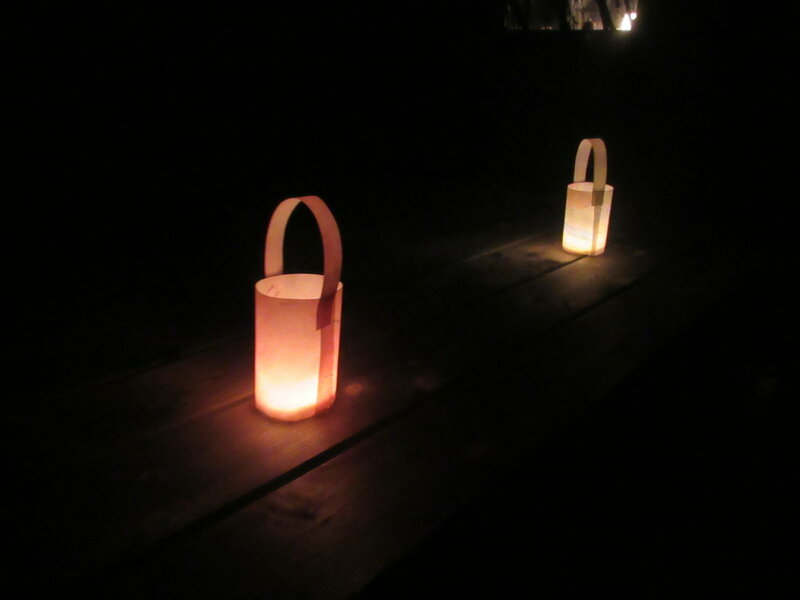 Under the clear evening sky in November, we had our annual lantern walk and Martinmas hosted by Gretchen and Jona. We gathered around a delightful campfire. We enjoyed the story of St. Martin told by Sherry Lovett. We heard about the humble heart of Martin wanted to help the poor. Sherry tells the story in the way that moves and inspire the audience. We would like to thank Sherry for coming to bring her gift of storytelling. We sang songs of St. Martin and other songs about lanterns. The songsheet was complied with a beautiful illustration by Heather Waters. We lit our hand made lanterns and started our walk around the neighborhood. By then it was starting to get dark and our lanterns glimmered beautifully just like the song we were singing. The sound of a creek that run nearby accompanied our singing. From time to time children needed their lanterns to be relit. When the candle wax was spilled and there was no way to re-light the candle, Rita gave her candle out of her lantern and put it in G's lantern. G's lantern started to glow again. We enjoyed our shared supper of warm soup and bread. Thank you everyone for your contribution. It was wonderful to spend the evening with you. We embraced the cold and dark winter together with the light of our lanterns and our warm friendship. From October through November, we sang apple songs. After some heavy frost, the apples were so much sweeter. It was time to make the applesauce. The steam was still rising from the cooked apples, and the sweet smells of apples filled the air. A. helped assemble the applesauce maker on the table. We looked at all the interesting parts that had a particular purpose. The spring, the funnel, the "slide", the handle, the spiral piece, and the metal piece with lots of tiny holes. After we put the pieces together, children were very curious how it was going to work. Plop! Went the cooked apples into the funnel. Crank! Went the handle round and round. Ooze! Went the applesauce squeezing through the tiny holes. Wee! Went the applesauce sliding down into the bowl. We took turns with different jobs. We sang "We are working as a family", and also the taking turn song. C.W. was spotted for dipping his finger into the bowl to taste (or just to feel the sauce). After we finished making the sauce, we took apart the machine and washed the parts in a hot soapy water. Hand brushes were handy to get small bits of apples that got stuck in the tiny holes. A. handed me the handle and said, "Here Mari, I washed the hitch for you". She had gone on a camping trip recently for her mother's birthday. I thought "hitch" was a good name for a handle which moves the whole operation. We served the applesauce at snack time and sent a little sample home for the families to enjoy. On a beautiful autumn Thursday, we were on our usual walk. Children are so observant and often talk about the changes in fields and gardens. We are so fortunate to be surrounded by well-maintained gardens, and over the year, we can see full circles of planting to harvest, and harvest to rest, and rest to new planting. Out in the field, children spotted Gardener Matt and children said a big hello. Matt was busily collecting something from the ground, but when he heard us, he stopped and invited us to come and join the sweet potato digging. Children were very excited to this opportunity to dig and look for the "treasures". Matt told the children that they need to put them gently in the crate like they are real babies. Children followed Matt's instruction and carefully lowered the sweet potatoes with both hands. When we were finished digging, we washed them under the garden water spouts. As the dirt got rinsed off, we could see the warm orange color of a sweet potato. Some children needed to wash them until every speck of dirt was rinsed off. We laid them under the apple tree in a single layer to air dry. Matt told the children that they are not supposed to stay in the sun because they will turn poisonous. We really enjoyed the spontaneous digging activities, and thankful for Matt and all the farmers in Celo for growing healthy food for the community. On October 23, we had a successful fall fundraising pasta meal at Celo Community Center. The parents and staff prepared delicious sauce for the pasta and baked lovely bread and desserts. The kitchen and dining room crew worked cheerfully and the children ate and played happily. This year we improved our meal by making sure we have caretakers for the children during the meal. Children's artwork was displayed all around the dining room. We served around 66 neighbors and community folks. Many of them left warm comments towards the program. It really felt as we all are a part of the childcare community. We had a wonderful Fall Field Trip to Arthur Morgan School on October 14th. It was wonderful to take the woodland trail across several hand built bridges. The trails were covered with a carpet of red and golden leaves. Children enjoyed stopping and visiting the creeks. We were welcomed by the AMS students who were pressing apple cider. Children helped put the apples into the funnel and as a student turned the wheel on the side, we watched the apples crushed into small bits. Some children took turns turning the wheels, but realized that it is not as easy as it looked. Then a big wheel on top was turned to squeeze out the apple juice. Younger ones wanted to dip their hands straight into the cider as it trickled down into a pot. The air was filled with a sweet smell of apples all around mixed with wood smoke coming out of school's chimney. We were so grateful for the rich experience. We jumped on the leaf pile. We had no idea that a student was hiding completely under the pile and we almost jumped right onto him! We settled at a picnic table and enjoyed our snack. Brad brought us warm apple cider enough for everyone to enjoy the taste of autumn! It was lovely. We went to say hello to turkeys and gave them some compost from the kitchen. They made lots of sounds that children imitated while we watched. We wondered what they were saying to each other. We tried digging for potatoes, but we did not find any, but we had fun anyway getting our hands in the dirt. We had such a fun day, but it wasn't over yet. Students hid cute little pumpkins along the trail on the way back. Everyone looked and found their pumpkins! When we were at a creek, F's pumpkin went floating down the creek. It got stuck on a big rock so the older children tried to save it. In a mean time, C got stung by a yellow jacket. While caring for him, the pumpkin flowed down the creek. T said, "Where did it go? ", so I said "Maybe all the way to Granny's beach". (I heard that later T. and mother went to the Granny's beach and T was looking for the pumpkin). We sang "Once I was a pumpkin" song on the way back to the soccer field where were met the parents. Special thanks to Brad for making it possible for the Fall Field Trip at AMS. First Week Back to Preschool! We had a wonderful first week back to preschool. The returning children were excited to see everyone, and the preschool rythem seemed to comfort them. The new children seemed happy to be at preschool. Everyone enjoyed the time when we sat together to share the snack. The lights in the main room were turned off so that we can all relax in the natural light. We found a seat to sit and held hands to make a circle around the table. First, there was lots of busy noise of chairs, cups hitting the table, children talking and making sounds all at once. When we held hand together, we took a big long breath, and tried to be quiet. It is only a brief moment or two, but very sweet time to have children join in the silence. Finally after the silence, we sing our grace, and "yum hum". We spread love all around with "butterflies". We have lots of rituals before the snack. Opal Violeta wrote me a note both in word and picture so that I would remember to bring matches to light a candle for snack time. These are pictures from the graduation in May. We had Vera's graduation. Vera is in kindergarten now. We had a bridge decorated with flowers on the side and rose petals for Vera to walk on. It signified that love is guiding her path of life. We sang "Rainbow Vera" as she walked on the bridge. Vera walked slowly and gracefully. She knows lots of virtues and she used them well at preschool. Everyone was so happy for Vera. After Vera opened the present (a big girl backpack!) and flower dedication to the teachers, all the children walked over the bridge to celebrate their wonderful year at preschool. Children picked some flowers and went back to preschool for the graduation cake. Congratulation Vera and happy summer to everyone! Thank you for the video and pictures, Ryan. On March 18th, we had a wonderful spring field trip to a sheep farm at Ben and Cedar's. We packed picnic lunch and children carried cup and napkins in a small sack. We took mostly Celo Community trails. All the walking children walked including Opal Claire and Ginger who were 1 year old. Forest rode on Mari's back. Children were so excited to see the sheep on the hill. Farmer Ben McCann came to greet us. He invited older children to go in the shelter to meet the lambs. Each lamb had a name tag on his or her ear. "So we can tell them apart", Ben said. Lambs were so cute. They had curly fur and long tails. Their mothers Baaed intensely when lambs were separated from them. Ben told us that sheep like to be with each other. They don't like to be far away from the group. Children pet the lamb while Ben held one in his arms. Children watched the lambs eat corn in the trough. They were hungry. Ben let the lambs go back to their mother in the field. We watched them find their mother and nursed from her. Children loved Lulu the donkey who protect the sheep from predators. Lulu is a gentle and friendly donkey to children. She still had shaggy winter fur. We then washed our hand with soap and water, and settled by a patch of yellow daffodils for our picnic snack. Children were hungry too after a good hike. Theo's grandfather helped fill the water and made sure every one got a good drink of water. After good visit, good food, and good diaper changes, we were ready to head back to preschool. We said good bye to the sheep, Lulu, and thank you to Ben for the wonderful visit. We picked up our stroller to carry Ginger and Opal Claire and took Hannah Branch Rd. back to preschool. Everyone was content and happy to play in the playground until pick up time arrived. It was nice to have Tilman and his mother join the field trip. I want to thank preschool's dedicated volunteers, Peg Chamberlain and Barb Perrin. We could not have done this trip without them. Spring Masquerade costumes this year was made from 10 large wool shirts donated by Appalatch- Theo's father's company. The dye was again from Cedar Johnson. My friend, Dari, and I had so much fun creating little capes, dresses, shorts, hats, and neck/belly warmers the night before. We felt like elves imagining how sweet children would look in the clothes! When children saw them, they were so excited! We went right into dying the costumes. Older girls wanted dresses, younger boys wanted capes, and others chose shorts to dye. Alena took few children at a time outside to dye their costumes while Rachel and I managed the more or less normal routine inside. We had a lovely snack time eating delicious sandwich bread made with Jonah's hands. Children remarked how Alena's purple-red curls on her hair looked just like the color of the dye. We had a lovely walk outside through the air filled with songs of spring birds and laughter of children. It was Alena's last day working at preschool. Children will miss her kind words and her creative senses, and the purple-red curls on her hair.